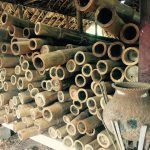 Our first Bamboo Treatment Tank Workshop in Myanmar was held in January 2016 in Naung Taung Monastic School, Hopong, Southern Shan State. The process used was hot water soak with borax and boric acid. 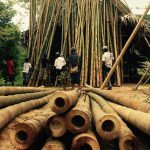 The process takes only a few hours, then the bamboo cures for roughly 4-6 weeks and then is ready for use. This simple borax treatment prolongs the life of the bamboo from the usual 4-5 years to last over 100 years if cared for carefully!! !